A Bouquet of Fresh Flowers is a Special Gift for anyone’s Birthday. Gifting Birthday flowers to your Lover, Parents (specially Mother), Friends & Family is an expression of your love and care towards them. So go ahead! Send birthday flowers & gifts with a personalized card message & surprise your loved ones. Remember flowers will make their special day that extra special. Remember the most gifted birthday flowers are Lilies, Orchids, Roses, Gerberas and Gladiolus. Send flowers same day to India using our local florists & flower shops. Order by 12 noon. Send Mother's Day Pink Roses, Lilies, Carnations & Special Gifts to India. Send Roses, Carnations, Lilies throughout India for occasions like Birthdays, Anniversaries, Funerals, etc. 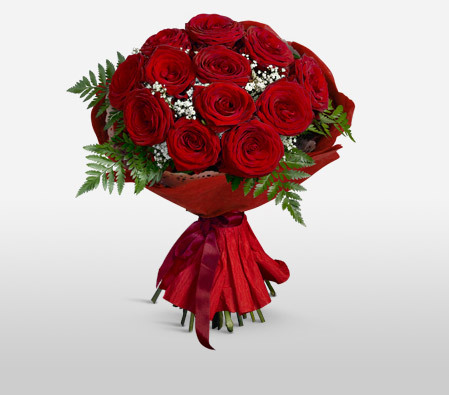 Enjoy affordable flower delivery across Mumbai, Delhi, Kolkata, Bangalore & nationwide delivery. Experience the joy of gifting heart-warming flowers and gifts to your loved ones with our guaranteed on time flower delivery. Be it birthdays, anniversaries or any other celebrations, you can choose from our exquisite collection and send flowers to India. For those who wish to send their heartfelt wishes from abroad can send flowers online to India using our flower delivery India service. Our gifts will surely be a memorable surprise for your loved ones. How do i send International Flower Delivery to India? 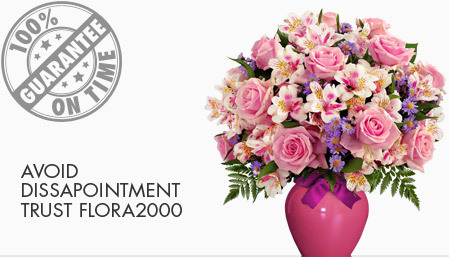 Flora2000 has transformed International flower delivery to India into a fine and effortless art. With our efficient flowers & gifs delivery services worldwide; you are sure to find the perfect expression of your message to your loved ones. Be it Roses, Lilies, Carnations or Cakes, our gifts are sure to make both the sender and the receiver happy. We make sure the gifts you give reflects what you feel about the receiver. Flower & Gifts are the ideal way to express mutual love and affection with each other in this busy schedule of everyone today. Since ancient times the idea of presenting gifts in India is well established. In olden times, Indians used to gift grains, cattle, fabrics, pottery, gold and silver ornaments etc to their dear ones but now sweets, fruits, antique pieces, flowers, toys for children’s, wines etc. A flower market, till recently restricted to religious and ceremonial occasions but today buyers are demanding not just the traditional jasmine, roses or marigold, but also exotic gladioli, carnations, lilies, tube-roses, gerberas, asters, candy tufts, lady's lace, orchids and anthuriums. Holi - A traditional Hindu festival that celebrates the beginning of spring. It also represents the conquest of good over evil. It is best known around the world for the powder that revellers throw on each other, leaving festival-goers coated in different colours by the end of the day. Diwali - Festival of lights. It is also one of the biggest festivals celebrated in India. Diwali falls between mid-October or November. Indians light traditional earthen Diyas on this day. Houses are decorated with colourful artworks called Rangoli (patterns created on the floor using coloured rice and/or powder). Onam – It us the biggest and the most important festival in the state of Kerala. It represents harvest and is celebrated with joy and enthusiasm all over the Kerala. According to a popular legend, the festival is celebrated to welcome King Mahabali, whose spirit is said to visit Kerala at the time of Onam. Ganesh Chaturthi - A Hindu festival that admires God Ganesha and equality amongst mankind. It’s a ten-day festival, which typically falls in Gregorian months of August or September. Eid-al-Fitr – Considered most vital days for Muslims, this is the "festival of breaking the fast". During Ramzan, Muslims refrain from eating and drinking from sunrise to sunset. Ramadan is one of the five Pillars of Islam, requiring prayers five times a day, generally encouraging a more reflective behaviour. Raksha Bandhan - One of the many popular festivals celebrated across India. Irrespective of caste and creed, people from all walks of life participate in this festival. The concept of Raksha Bandhan is mainly that of protection, by a brother to his sister. Dussehra – This festival celebrates the Hindu God Rama's victory over the demon king Ravana. Dussehra represents triumph of good over evil. Marigold flowers are the best significance during these ten nights of wisdom. Makar Sankranti is mostly set to be celebrated on 14th/15th January. It is considered the perfect way to continue the celebrations of the year that went by and also to mark the beginning of the harvest season. Janmashtami commemorates the earthly appearance of Krishna, who is described in India’s sacred writings as God Himself. It is one of the biggest religious festivals in the world. The significance of Raksha Bandhan is tremendous in India. It is celebrated no lesser than any other festival, as it is dedicated to the love of a sister and her brother. Raksha means (Protection) and Bandhan (Relation). On this day, a sister ties ‘Rakhi’ around her brother’s wrist while the brother undertakes a pledge to protect his sister until death. He promises to stand by his sister throughout determinedly. Sisters tying the sacred thread around the wrists of brothers are a symbol of attachment, meant to strengthen their bond of love. The significance of this festival is indisputable as siblings come close on this very day. Apart from getting his wrist tied with a Rakhi, the brother owes a gift to his sister. Expensive or inexpensive, the gift is cherished by all sisters. Handpicked Unique Gift Ideas for Mom. Fresh Roses, Lilies, Carnation & Gift Hampers specially crafted for your mum. Order NOW for guaranteed delivery on Mother’s day in India.